With the World Cup in full swing and England enjoying some early success in the competition, the country is in high spirits, daring to dream and anticipating a memorable summer of football –could this be the first time the three lions walk off the pitch with the trophy in hand since 1966? Here at Parcel2Go, we’re gripped with World Cup fever… which got us thinking about all the kits, memorabilia and other merchandise that football fans up and down the country must have from bygone World Cups gathering dust in attics and drawers. So, we decided to put together this ultimate guide to help you identify whether some of your old gear is valuable in today’s thriving vintage/ nostalgia market. There’s currently a thriving market for vintage football shirts and memorabilia on the market. With online selling made easy by e-commerce auction sites like eBay, shpock and Depop, just about anybody can sell-on their unwanted items and make some cash. Here are some current examples we found online of items that are selling for many times their original purchase price, here are some of our best finds. The 1990 World Cup is one of the most iconic for England fans in recent times. Say ‘Italia ‘90’ to anyone of a certain vintage and watch as they fondly recall the hope, expectation and ultimately heartache experienced by Paul Gascoigne and the boys from the spot against eventual winners West Germany. We came across a great site which buys and sells both new and old football shirts. 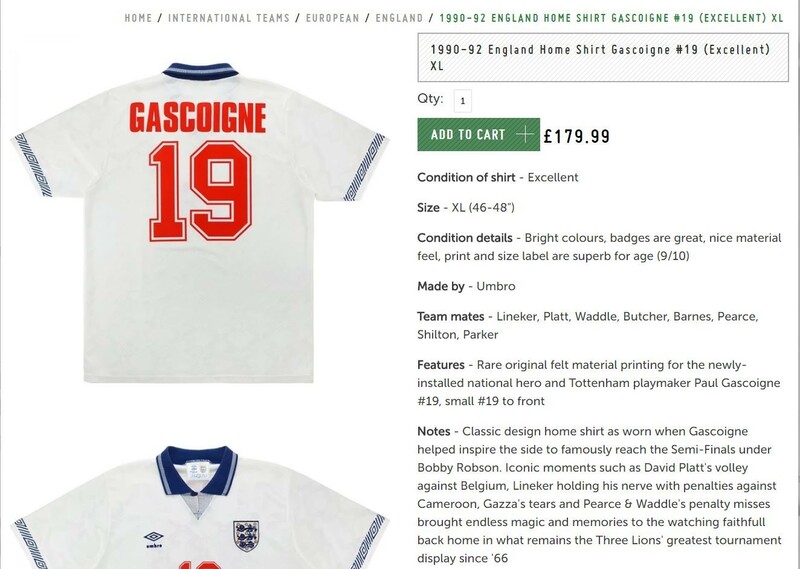 An England replica shirt from Italia ’90 is currently listed for a tidy £179.99! 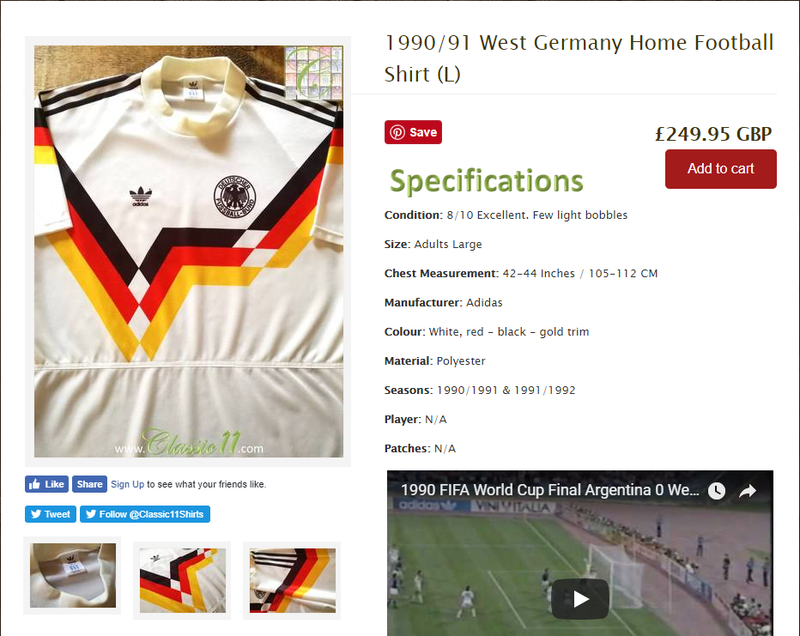 The famous shirt with original adidas emblem (on sale here), worn by West-Germany in the World Cup in 1990 is a sought-after collector’s item. Not only did they win the tournament in this the jersey, but it was the last year before East and West Germany unified, meaning the kit is even more significant. In true vintage Adidas style, the jersey featured the famous three stripes on the shoulders and incorporated the country’s colours of Black, Red and Yellow in a classy geometric design across the front. This shirt is so iconic that adidas have even released this year’s offering as a homage! We found a near mint condition one on selling foran for a whopping £249.95. Any of the Brazil jerseys deserve a place on our list, however, the 1986 shirt made it on here as it’s fabulously old school with the classic green V neck and collar. A break from the near duopoly of Nike and Adidas, this kit was manufactured by Brazilian brand Topper and was the inspiration for the 2009 Nike kit. 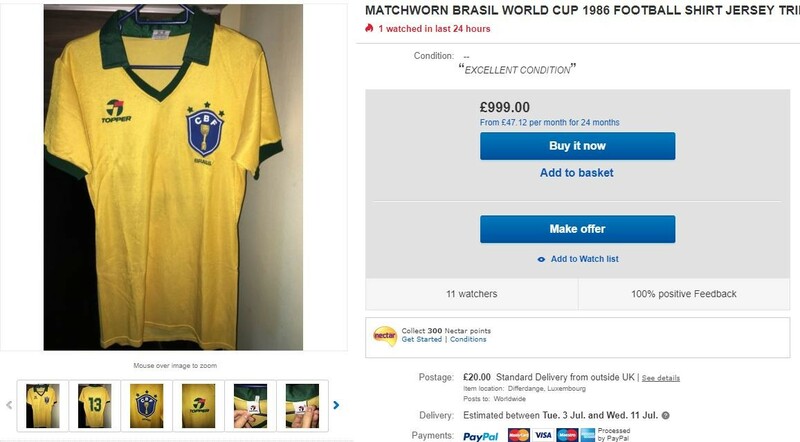 We found a truly rare shirt on eBay, a at Mexico 1986 World Cup selling for £999. Not every sticker book is going to make thousands of pounds, or even hundreds, but there are a select few that bring in big money. Mexico 1970 was the first World Cup album that Panini produced and - coupled with the now legendary status of the tournament - puts this item in high demand. We found a complete sticker album on eBay priced at £5,500. Is my old World Cup merchandise worth anything? Coming from the home of football, the beautiful game is part of our makeup and tradition, and if you (or a family member) is a long-term fan, there’s a good chance that you own something that’s crossed the divide from old tat to desirable vintage football memorabilia. Last year, an -incomplete- Panini World Cup sticker album from Mexico 1970 (it had 8 stickers missing) sold for £1,132 on eBay. So, it’s well worth looking up in your loft, going through old cupboards and dusty boxes to see if you’ve got anything that could be of interest to avid fans, football hipsters or collectors. If you’re unsure if something could be of value and worth selling, a quick google and eBay search to see what similar items are selling for is a good start! But make sure they are in good condition; damaged, over-worn or tatty items are far less desirable and are unlikely to sell. Do you fancy yourself as having a keen eye for spotting diamonds in the rough? Thrift and vintage stores could offer a treasure trove of opportunities. Buying and selling vintage clothing is becoming increasingly popular, more and more people are rummaging through the racks of their local thrift stores and charity shops to find a bargain that is likely to sell for a nice profit. Even multi-million-dollar company Nasty Gal famously started out as an eBay store selling vintage clothes. Charity shops and thrift stores are great places to go when on the hunt for vintage football jerseys, or memorabilia (most stores have a section of odd bits and bobs). When looking through the rails at your local store, there are a couple of things you need to be paying particular attention to. The first is to make sure an item is genuine. The last thing you want to do is part with your money only to discover later you bought a cheap knock-off. Secondly, pay close attention to the condition of the item. Anything that is in poor condition, as previously mentioned, is highly unlikely to sell. Check the item front and back, inside and out, ensure there are no tears, rips or stains/marks. Ideally items should have original sewn in labels showing brand, size and care instructions. Millions of football shirts are sold worldwide every year, but there are very few that are worth a substantial amount of money. Aesthetics, although important, can play a surprisingly insignificant role in the value of a vintage football jersey; in fact, the history and meaning associated with a design is what brings widespread interest and the big money online. The shirt that Geoff Hurst wore when he scored the winning goal in the 1966 World Cup was sold at auction in 2000 for £91,750. It was later sold on in 2012 for an eye watering £2.3 million. If England hadn’t won that year, the value of the shirt would have been a fraction of that. Similarly, the shirt worn by Pele in the 1970 World Cup final sold for £157,750 at Christies in London back in 2002. Pele scored the first goal of the game and is still considered the greatest footballer of all time. So, if you are buying a vintage kit, or selling on one you already own, do some research on the player, the year it was made or the tournament it may have been worn in – this will give you a real idea how much it could sell for. Typically, a lightly worn or unworn jersey in a standard size – a UK size 8 or 10 or men’s Medium or Large – will sell for more. However, there are many buyers in the market for football jerseys as collector’s items, for framing or for reselling and have no intention of wearing them. Less common or awkward sizes will likely have been worn significantly less; items that haven’t been worn very often and are in near new condition will naturally be more valuable. So, if you manage to unearth a long forgotten-about vintage jersey at home… don’t set the bar too low in terms of value because it’s a size you feel people won’t want. Collectors, mad fans and football hipsters are usually as interested in the condition of a rare shirt as they are the era it comes from. Overall Look – with clothing it’s not always easy to spot a fake. However, if you are buying a vintage football shirt, you should be able to quite easily tell if it’s genuine. If it looks ‘of the era’ then that’s a great start, you can then check off the rest of the points on this list. Quality of the fabric – modern replica football shirts are made of high quality fabric. If the quality of the fabric feels poor, has bobbles or lacks the typical under arm ventilation, it's likely not of a high quality. Use your intuition here, if you feel the fabric and you think it feels ‘cheap’ chances are it is. Labels – all original jerseys should have a branded, sewn in label. If it does but you’re unsure as to whether it’s fake or not, research and compare it to other labels by that brand. They may have changed slightly over the years, but should be also made of high quality fabric, be branded and well attached. Stitching – genuine shirts will have impeccable stitching as they will have been meticulously checked during production. With older shirts there may be some light bobbling or loose threading due to wear, however, a well-made shirt in resaleable condition should have minimal/ inconsequential blemishes. Logos – the logos will vary on each kit, some will be embroidered, and others will be pressed on. Do an internet search of the jersey from that year to see how the logos are attached. You also want to check placement, wording and quality – if it is a pressed-on logo, it shouldn’t be peeling off or have an almost sticky texture to it. This is a tell-tale sign of a fake. You’ve got your stock, checked it over and have decided that it’s time to part ways with your once loved shirt. First of all, we would suggest setting an achievable but desirable price. Do some research to help determine how much your item is worth and could realistically sell for. Decide the absolute lowest price you would accept for it and go from there. It’s now time to sell. There are a few ways you may want to go about selling on your item, depending on your preference, the most common will be online or in-store at a vintage shop. Most vintage stores will be willing to pay you cash for your item if it’s in a saleable condition. This is a quick and easy way to make some money as it requires minimal effort on your part. But, they will probably pay you less than half retail value. Today we live in an online world, with the majority of retail sales coming from online shoppers, and with selling platforms such as eBay and Amazon – selling your vintage goods online has never been easier. Most of the platforms are very straightforward and easy to use, simply create the listing, upload the images and wait for someone to buy it. Then it’s a simple case of posting the item out to its new owner. The great thing about selling online is that you can reach a much wider audience and sell the item anywhere in the world. It allows you more control over your listings while saving time on your deliveries. You can tailor your preferences for each item you send and even include the courier you'd like to use and your preferred payment method. Smart send allows you to save time by importing item details and delivery addresses from the e-commerce channels, meaning you don’t have to manually input the details when sending. It’s important to note that the rarer the memorabilia or less available it is, the higher in value it is likely to be, people will pay more for something that very few people have. When doing your research, if you find there are a lot of the same item around don’t expect to be able to ask for a great deal for it. In highly saturated markets, buyers will go for the option that is the cheapest, so be realistic with yourself on how much you can get for it. With the 2018 World Cup well under way, you may want to invest in jerseys that could be valuable in years to come. Some of the current kits have already caused a frenzy among football fans around the world – we have made a list of the ones we believe could make you some money in the future. Nigeria Kit - was sold out globally within three hours. The kit, which was released on June 1st, is without a doubt the most talked about kit of the tournament. With black, green and white stripes giving off 80’s / early 90’s retro vibes, everyone wants to get their hands on it. If you can get a hold of one keep it in good condition, it could be worth a pretty penny in the future. England Kit – this may not be the most exciting looking jersey on the pitch, however the simple design is timeless and classic. With England’s performance ensuring we make it out of the group stages, it’s looking promising that this year we could go far… and if we do, the shirt could become a nostalgia piece in the future. Winning Team – at this point there’s no telling who will win the most sought-after trophy in world football; however, whoever does lift the famous trophy, rest assured that the demand for and therefore value of their kit will skyrocket in years to come. Whether you’re a first-time seller or a seasoned pro, it’s always important to do your research when selling on vintage jerseys or other World Cup memorabilia. There’s no doubt that right now there is a huge market for all things retro football, and interest peaks during huge tournaments so if you do already have an item in mind, now would be a great time to get selling. To book the most reliable couriers at the lowest price, visit Parcel2Go.com you can get a free, quick quote and choose the delivery service that suits you, so you can rest assured that your beloved item will reach its new owner quickly and safely.